Qiu Anxiong was born in Sichuan in 1972. In 1994 he graduated from Sichuan Fine Art Institute. Qiu also later studied at the Kunsthochschule Kassel in Germany, completing his course there in 2003 and returning to China the following year to live and work in Shanghai. 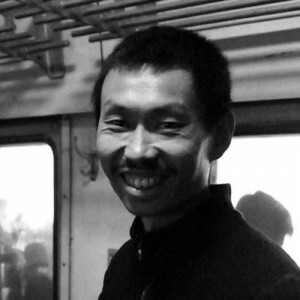 Qiu currently teaches at the School of Design under East China Normal University. Qiu’s works explore the connection between China’s traditional culture and the advance of modernity, also relativity and false existence in time and history. Qiu creates his works in a variety of media, including animations, installation, video installation and photography. Signature works include the animated short films New Classic of Mountains and Seas and Minguo Landscape and the video installation Memory for Forgetting. His art has been shown at major exhibitions in China and overseas, including the Shanghai Biennale, Guangzhou Triennial, Venice Biennale, the ‘Art Unlimited’ section of Art Basel, Cairo Biennale, Thessaloniki Biennale, Asia Pacific Triennial of Contemporary Art and St Petersburg Biennale. Qiu has also held solo exhibitions at major institutions such as the Museum of Contemporary Art in Tokyo, A Centre for Contemporary Asian Art in Sydney, Arken Museum of Modern Art in Copenhagen and the Spencer Museum of Art at the University of Kansas. Works by Qiu are now held in the collections of the Museum of Modern Art in New York, the Spencer Museum of Art in Kansas and Museum of Contemporary Art in Tokyo. Qiu was honoured at the biannual Chinese Contemporary Art Awards in 2006, with an award for young artists in the 2007 annual Artron Awards and the critics’ prize at the Lianzhou International Photo Festival. Other honours Qiu has received include the 2009 China Critics’ Association’s annual award for best young artist and the literature prize at the 2010 annualGaizao Lishi (‘Reshaping History’) exhibition of contemporary art.